HOLD THAT TIGER (USA) (Chestnut 2000-Stud 2004). 3 wins at 2, Longchamp Grand Criterium, Gr.1. Sire of 694 rnrs, 459 wnrs, 17 SW, inc. Smiling Tiger (Del Mar Bing Crosby S., Gr.1), Withgreatpleasure, Jungle Wave, Red Typhoon, Temper Tantrum, Tiger Girl, Apprehend, Coy Cat, Hungry Tigress, Old Man Buck, Whipsaw, I Dazzle, Table Games, Thats a Heckofacat, Tiger Shark, Hold That Prospect, Mikimoto's Mojo, SP Fast Tigress, Danse Grecque, Wincat, etc. Elite Tiger (g. by Hold That Tiger). 4 wins. See below. Kaybeejay. Winner at 1200m in Aust. Producer. Daniel Samson (Danske). 6 wins to 1400m, Hawke's Bay Taradale Club H., RSA H., Manawatu RC New Zealand Bloodstock H., 2d WRC Colin Perry Harvey World Travel 3YO S., Simply Food H., 3d Levin S.H., L, WRC Karenzimmerman.co.nz H., Porirua Club Cup. Agavero (Daggers Drawn). 2 wins-1 at 2-at 1200m, Avondale JC Fruit World Greenlane 2YO H., Sapich Brothers Wines H., 3d Levin RC Ryder S., L, BOP RC Zest 2000 3YO H. Producer. Thorn Pass. 4 wins from 1200m to 2300m to 2015-16, Marton JC Bell Booth Ltd S., Spreading Rural Bulk H., 2d Rangitikei RC TRC Toyota H.
CROSSYOURHEART (Show a Heart). Top filly on the 2006-07 NZ 2YO Free H. 6 wins-4 at 2-to 1200m, NZ$358,475, Waikato RC New Zealand Bloodstock Classique, L, Counties Challenge S., L. Producer. ALL THRILLS TOO (St Covet). 8 wins at 1000m, 1200m, HK$16,934,500, Hong Kong Sprint, Gr.1, HKJC International Sprint Trial H., HK-3, National Panasonic Cup H., Banyan H., Sprint Trial Trophy H., Washington DC H., 2d HKJC Centenary Sprint Cup, HK-1, Chairman's Sprint Prize, HK-1, 3d Hong Kong Sprint, Gr.2, HKJC Bauhinia Sprint Trophy, HK-1, Centenary Sprint Cup, HK-1, Juvenile Sprint Trophy, HK-3. SILKY RED BOXER (Casual Lies). 10 wins-1 at 2-from 1100m to 2000m, NZ$236,800, A$203,900, BOP RC Japan-New Zealand International Trophy, Gr.2, Cambridge Breeders' S., Gr.3, STC Parramatta Cup, L, 2d BOP RC Japan-New Zealand International Trophy, Gr.2, WRC Thompson H., Gr.3-twice, 3d Canterbury Gold Cup, Gr.3, WRC Wellington S., Gr.3, Qld Tatt's RC Tattersall's Open Mile, L.
LUCIA VALENTINA (Savabeel). Top Filly of 2013-14 Australasian 3YO Classification (Intermediate). 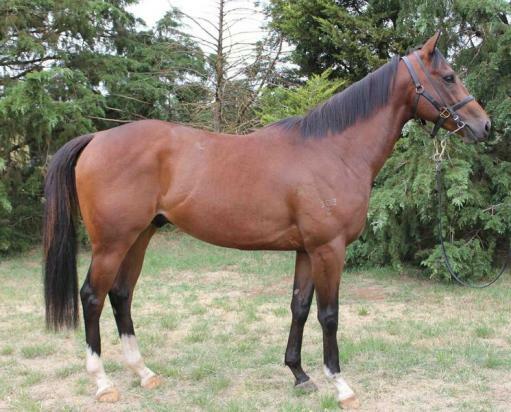 Joint Top Filly on The 2013-14 NZ 3YO Free H (1600m+). 7 wins from 1200m to 2000m, NZ$64,500, A$4,013,450, HK$825,000, to 2015-16, ATC Vinery Stud S., Gr.1, Queen Elizabeth S., Gr.1, VRC Turnbull S., Gr.1, ATC Tramway S., Gr.2, VRC Matriarch S., Gr.2, Levin RC Wellington S., Gr.3, 2d ARC Royal S., Gr.2, 3d Australian Oaks, Gr.1, ATC Ranvet S., Gr.1, MRC Caulfield Cup, Gr.1, ATC Surround S., Gr.2, 4th ATC George Main S., Gr.1. MALANDRINO - BEST SHOW (H.K.) (Darci Brahma). 5 wins from 1600m to 2200m, NZ$56,475, HK$2,552,900, to 2014-15, Manawatu Classic, Gr.3, HKJC France Galop Cup, Roselle H., 2d Waikato RC Hauraki 96.2 FM H.
Race Record: 15 Starts 4-3-1 A$76,690. 4 wins to 1400m, A$76,690, to 2015-16, 2d VRC Comic Court H.